Beyond a basic orientation to the software, what’s the number one thing people want help with in Scrivener? Ready? 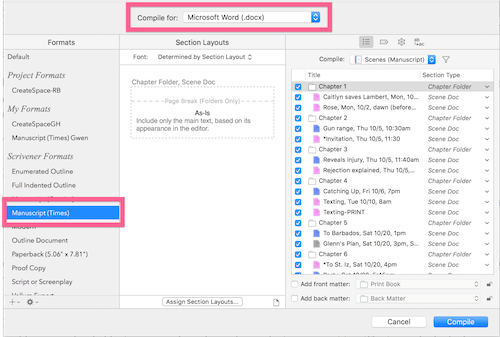 In this second installment on compiling, I’m going to help you export your manuscript to a Word document, but the process is similar for other types of output. Why might you want to compile to a DOCX file? Submission to an agent or editor. To give your manuscript to a critique partner, friend, or beta reader. To read through your manuscript and make notes. Compatibility with Microsoft Word (duh), Apple Pages, and other word processors that will open or import DOCX files. TIP: DOCX files are based on Rich Text Format (RTF), which is compatible across more word processors, and may do a better job of exporting images, lists, and tables than DOCX. RTF is also best when exporting for Apple Pages. If you’d prefer to create an RTF, choose Rich Text (.rtf) in step 2 of “Choosing Your Format” below. Whatever your reason, you can create a lovely DOCX without too much fuss. I promise. Before you start, be sure you’ve set up your section types under Project>Project Settings>Section Types. 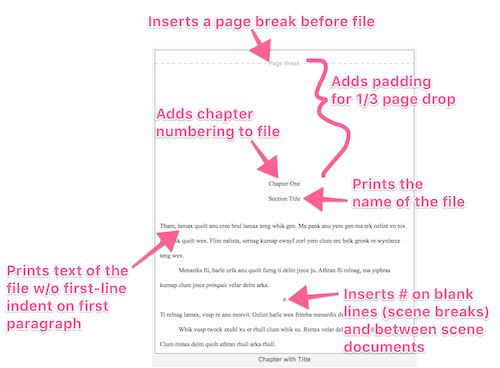 The format determines what the final output will look like, including the margins, fonts, line spacing, first-line indents, chapter headings, scene dividers, and paper size. For this example, we’re going to choose a submission-style format. Go to File>Compile (or click the Compile button on the toolbar). The Compile window opens. From the Compile For dropdown at the top, choose Microsoft Word (.docx). In the Formats column at the left, select Manuscript (Times). This format also works for other types of output, like RTF, Print, PDF (if not creating a paperback book), and HTML. If you’ve never assigned section layouts for this format, you’ll see a yellow box in the Section Layouts column (center) warning you about it. Even if you have, you’ll want to ensure they’re correct for the current project. The following image shows common elements of a section layouts “tile” and what they represent. I selected this layout because it shows most of the possible elements, but this one would work best for those who do not use chapter folders, and have one document for each chapter. 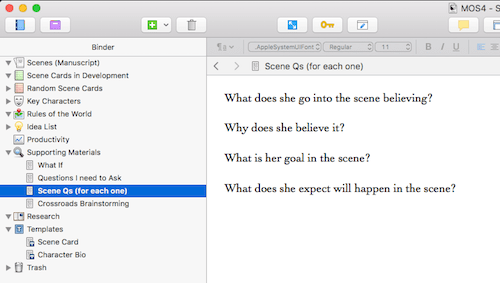 I recently started working through Story Genius by Lisa Cron to help me write the fourth story in my romantic suspense series, and long before she started talking about organization (Chapter 11), I was—shocking, I know—thinking about how to set things up in Scrivener. When you create a new project in Scrivener, your first decision is which project template (predefined framework) to select. If you’re going to use a document template (like a form you can fill out repeatedly without ruining the original) as a basis for your Story Genius-style scene cards or character bios, I recommend choosing the Novel project template—which already has a Templates folder built in—and then deleting everything you don’t need. NOTE: You cannot delete the Draft, Research, or Trash folders, though you can rename them and change their icons. If you don’t care about having a document template for the scene cards or character bios, I’d choose the Blank project template. Then, delete the Chapter folder and Untitled document (select an item to delete and go to Documents—>Move to Trash). 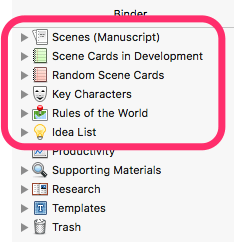 In Story Genius, Lisa recommends that you have six folders to keep track of your story’s facets: Key Characters, The Rules of the World, Idea List, Random Scene Cards, Scene Cards in Development, and Scenes. 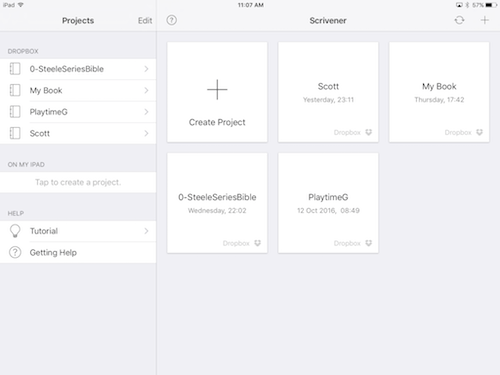 I created new folders for the first five (Project—>New Folder), and then renamed the Draft folder to Scenes. 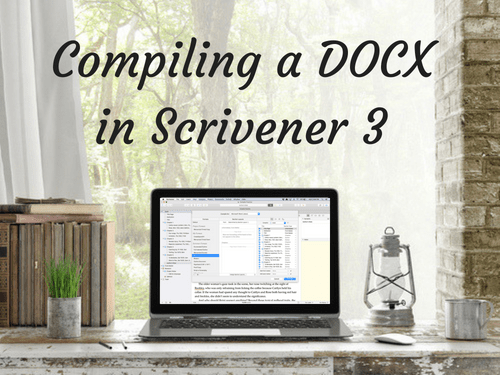 I did it that way because, with a few exceptions, Scrivener will only compile (export) items that are located inside the Draft folder. Draft, or whatever you decide to name it, is also where Scrivener looks when calculating your word count in Project Targets. To give each folder a unique icon, select the folder and go to Documents—>Change Icon. In addition to the six prescribed folders—which I ordered according to my own preference—I also added a Supporting Materials folder to store some of the preliminary exercises, a Productivity document where I track my daily work on the story, and a Templates folder to store Scene Card and Character Bio document templates that I created. But working with Scrivener doesn’t have to be scary. 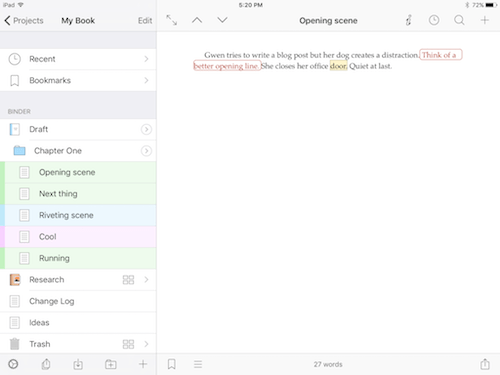 In fact, for those who find all the options in the regular version of Scrivener hair-raising, I thought you might enjoy a quick primer on the newest kid in the Literature & Latte family: the Scrivener for iOS app. 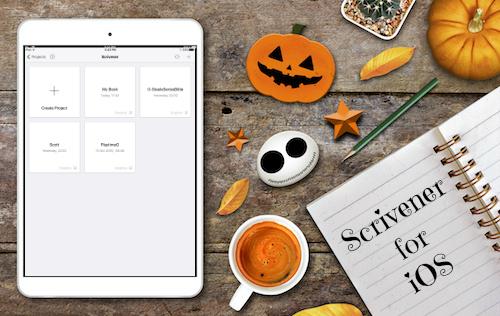 Yes, that’s right, you can now write on the go with only an iPhone or iPad, and sync your work back to Scrivener on your Mac or PC. 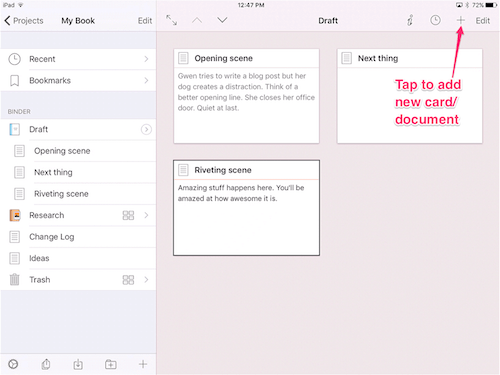 The app combines the familiar functionality of iOS with the best of Scrivener’s features. Many of you might even find it more intuitive than the original software, especially once you realize some of the handiest editing features are hiding out on the extended keyboard (see Making Notes below). So what did the app inherit from its older siblings? The Binder, Corkboard (iPad only), and Inspector are there. You can set goals and track progress (with a cool new look), add comments and annotations, color code your documents with Labels, add a Status, add document notes, and even compile your work (with limited options). And lots more. Once you’ve synced your working projects to Dropbox—and have wifi or cell access—you can open a project on your iPhone or iPad and tap out your thoughts. You can even create a new project right in the app and sync it with your computer later. 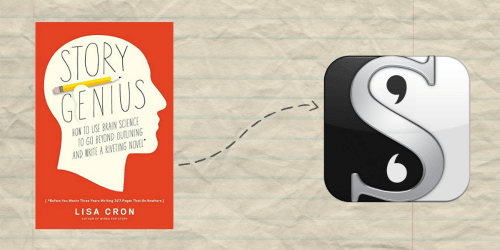 Imagine all the places you could write—or jot down sudden bursts of inspiration—without lugging along a laptop! The Projects screen is where you open or create a new project. Unlike on the Mac or Windows version, you can only work with one project at a time, but switching between them is as simple as navigating to the Projects pane (tap the back arrow in the upper left corner until you reach the Projects screen, which will close the project you were in) and choosing a new one. All the flexibility that makes Scrivener great for pantsers, plotters, and hybrids alike is alive and well in the iOS version. Tap the + in the upper right corner to create a new card. Title it and add a brief synopsis of the scene, if desired. Once you have the bones of your manuscript laid out, you can add the meat of the story. Pantsers: Show up on day one, select the Draft folder, create a blank document and start writing until you finish a scene or chapter. Repeat. No spells required. Imagine having everything you need for your current manuscript stored in one place, easily accessible, organized, searchable, and—if you work on a laptop—fully mobile. 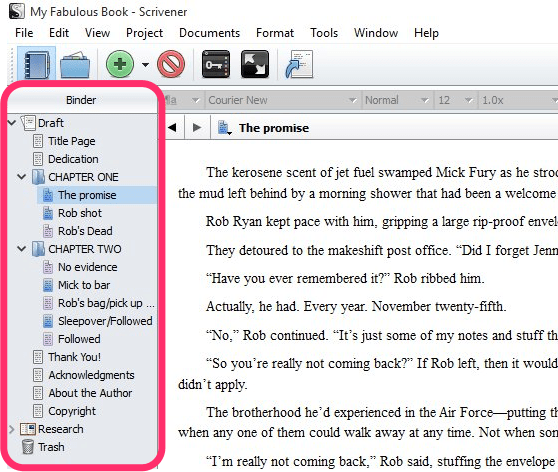 With Scrivener, you can! 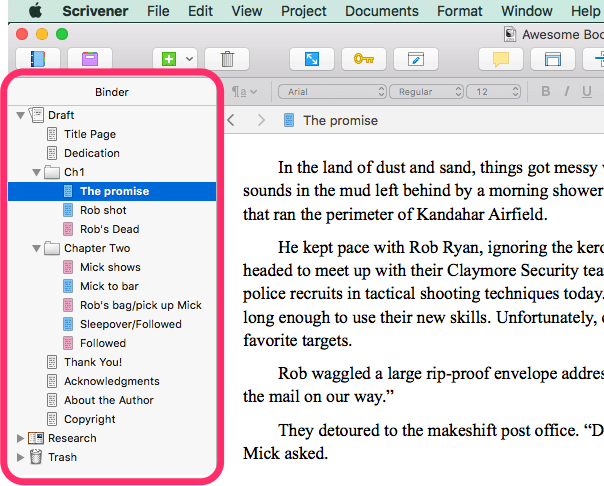 Scrivener lets you keep not only your writing, but also your notes, images, research, web pages, and other supporting materials right inside your project. 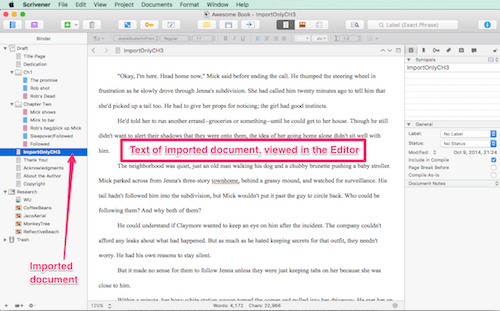 You can even bring in work from another word processor, so you don’t have to finish your manuscript to start writing in Scrivener. When you import a file, it appears in the Binder. The Binder is the left-hand sidebar that shows you every folder and file housed within your project, and allows you to add, view, move, rename, delete, or copy them. I like to think of it as a virtual filing cabinet where I can store and organize everything associated with a project. The Draft folder (also called Manuscript, Screenplay, or something else depending on which template you chose when you created the project) can only hold text documents. Image files, PDFs, web pages, and other non-text type files must be stored somewhere outside of the Draft folder (e.g. the Research folder, or a folder you create). TIP: Don’t store things in the Trash folder. ;-) That’s where Scrivener sends files when you delete them (to give you a chance to change your mind). Okay, ready? Here’s how to import anything into your project. Want to import a document, image, PDF, spreadsheet, or presentation? This procedure works for anything except a web page. Alternatively, you may right-click the folder (Control+click on a Mac) and choose Add—>Existing Files. 3. Select the desired file(s). 4. Click Import. You may get a warning about converting the file to RTF format. Click Import again. The imported file now shows up under the selected folder. To edit or view the file, select it in the Binder. The file contents appear in the Editor (page of text in the center).